The above event was organised and funded by the Asia/Pacific Cultural Centre for UNESCO (ACCU), a Japanese semi-government body. The events sought to enhance awareness regarding the need for preserving "modern heritage" in its entirety given that recognition in Japan of its importance is generally lacking compared to the heritage of the more distant past. The industrial heritage of railways was selected noting that it functions not as a single unit but as an overall system including trains, bridges, tunnels and stations. Six international organisations, including Puffing Billy Railway were invited to participate and present papers, together with eight Japanese experts in the field. PBR sought expressions of interest from its leadership/management team to accept the invitation and I was chosen to attend. Participants and official observers were taken by coach from Nara to Kyoto where we first visited	Umekoji Steam Locomotive Museum operated by railway company JR West. It is based in a 1914-build roundhouse/turntable complex comprising 20 stalls housing 18 steam locomotives, including 7 which are operable. The building is the oldest concrete loco depot in Japan and a designated cultural site by the national government. Umekoji Steam Locomotive Museum (above top) and Nijo station house (above). The entrance/display/administration building is the re-located former Nijo station house, the oldest wooden railway station in Japan. The facility employs 28 staff(! ), operates 6 days a week and receives 200,000 visitors per annum (50% in school groups). JR-West provides steam train rides on a 1km (approx.10 minute) round-trip 3 times each day. A second loco was in steam for our visit, providing demonstrations of the use of the turntable. Japan&apos;s only operating vintage tramcar. Adjacent is a modern depot and short running line for Japan&apos;s only operating vintage tramcar, a 4-wheel British-built car. Unfortunately it was not running during our visit due to track work in progress. Lake Biwa Canal Museum of Kyoto. After Lunch we visited the	Lake Biwa Canal Museum of Kyoto operated by the Kyoto Municipal Waterworks Bureau. This was Japan&apos;s first artificial canal, completed in 1890, including tunnels and viaducts, to provide water supply, hydro power (original Pelton wheel & dynamo on display) and goods transport (including a counterbalance incline railway to raise & lower boats). See this	link for a civil engineering history of the Canal. Our Kyoto visit concluded with a visit to the nearby Temple. The invitation-only conference was held in the Nara Public Hall, a modern conference centre with facilities for simultaneous translation (Japanese-English). Present, in addition to the participants, were ACCU staff and selected observers, including 3 from Hungtu Alishan International Development Inc, the private company due to take over operation of the Alishan Forest Railway in Taiwan from the government in 2008. The Shay in the Puffing Billy Steam Museum is from this line. Conference held in Nara Public Hall. Printed abstracts (in English) of all speeches and papers were provided to participants. Full papers are due for publication in the next couple of months. First keynote was on the protection of railway heritage as part of the heritage of modernisation in Japan by Yamato Satoshi of the Department of Cultural Property Protection, Agency for Cultural Affairs, Japan. He described the legal and funding frameworks for the Japanese equivalent to our Australian Register for the National Estate, the 9 railway-related facilities designated as "important cultural properties" and some of the 67 that are "registered tangible cultural properties." The Second keynote Collecting and Restoring of Railway Objects at the German Technical Museum (Deutsches Technikmuseum) in Berlin, was delivered by Department Head Alfred Gottwaldt. He emphasized their philosophies of explaining the role of technology in society rather than "how machines work" and of generally conserving locos, meaning they may remain rusty and greasy but also genuine and authentic, rather than restoring to ex-factory condition such as is done by	National Railroad Museum (NRM) in York, UK. He asked, "Would you ever dare to rewind an Egyptian mummy with modern fabric in order to give it the immaculate appearance it once had? Of course not. Why then apply modern paint to rusty metal sheets of a locomotive?..." Group photo (above top), author delivers Puffing Billy report (above). After the group photo session and lunch I delivered "report 1" Puffing Billy - Success factors for Australia&apos;s first and leading preserved operating steam railway. I&apos;d arranged for participants to receive, upon registration, copies of the PBR souvenir book, promotional DVD, ETRB & PBPS Annual Reports, timetable and other collateral. Matthew Thompson delivering 2nd report. Report 2 was Volunteers and Railway Heritage - the context and mechanics of a volunteer program in the museum sector by Matthew Thompson, volunteering manager at the National Railway Museum, UK. He discussed volunteer motivators, and the "mechanics" (paperwork) of a volunteer programme, and drew on both NRM and North Yorkshire Moors Railway as case studies. The Japanese, who don&apos;t have a large volunteering tradition, asked both of us many questions about this topic. Report 3 by Shirai Akira (shown being introduced by MC Mr. Nishimura of ACCU), Chief Executive, Nagoya Rail Archives, was on History of the Conservation Activities of the Oigawa Railway. This 65 km-long private line, 200 km west of Tokyo uses electric trains mainly and incorporates the Abt rack system on some sections. Since 1975 regular steam services operate on a 40km section of the line. with annual patronage growing from 50,000 to 200,000 and a fleet of six steam locos (four serviceable) and 20 coaches. This includes the train of the	Japan National Trust. He addressed issues of generation to generation transfer of technical expertise, sourcing supplies (e.g. high temperature oils, Coal), safety and environment. Final report (4) for day 2 was by Rajesh Agrawal, Executive Director (Heritage), Ministry of Railways, India on Recognition, management and conservation challenges of recent heritage - "heritage rail parks" in which he discussed issues of formulation of three relatively recent successful UNESCO World Heritage Site applications, including 2 mountain railways. His theme of a heritage park management area has many similarities to our 1992 Puffing Billy Corridor Landscape Evaluation Study funded by The National Estate Committee (Victoria) and I agreed to send him a copy. The day concluded with an official reception, which, after a short address by the ACCU Director and response by Herr Gottwaldt, was mostly an informal social event. Report 5 was a comprehensive summary of Railway Museums and Railway Preservation Activities in Japan by Suga Tatsuhiko, Director of Transportation Museum, Tokyo. His museum in inner Tokyo, operated by JR-East, will close shortly to relocate to Omiya, Saitama City, some 30 km north of Tokyo. The new larger site, due to open in October 2007, will accommodate 35 real vehicles and a much more spacious exhibition hall. This paper is a good overview for anyone planning an extended rail heritage holiday in Japan. Suga Tatsuhiko (above top) and Jia Banyi (above). Report 6, delivered in Chinese and translated into both Japanese and English, was from Jia Banyi, Deputy director of the China Railway Museum in Beijing. Historic Relic of China Railway - Protection and Utilisation are Principal Part commenced with an overview of major railway museums developed in China since the 1980s then analysed the criteria used for defining a relic. Report 7 by Choi Byungha, from the division of modern heritage, office of cultural properties, Korea (South), spoke (in Japanese) on Conservation and Utilization of railway heritages to future generations in South Korea. Being an architect by training, he focused on rail structures and discussed the issue of generating appreciation of rail heritage when railways to some symbolise the Japanese colonial period. The 8th Report was on Preservation of Freight Railway Legacies by Iwasa Katsuji, a director of the voluntary group Freight Railway Museum and by profession a senior advisor (safety) with Japan Freight Railway Co. Ltd. This voluntary group has assembled, using member funds, a collection of about a dozen four-wheel goods vehicles displayed in and around a goods shed adjacent to a station on a private commercial railway. The final report (10) was on Historic Railway Bridges and Viaducts - present situation and conservation by Konishi Junichi, a civil engineering professor at Japan Shinshu University. He identified about two dozen historically significant bridges either (a) in rail service in their original location, (b) in situ but now used for road or foot traffic, (c) recycled in use at other locations, (d) disused or abandoned and even (d) relocated to a display location. 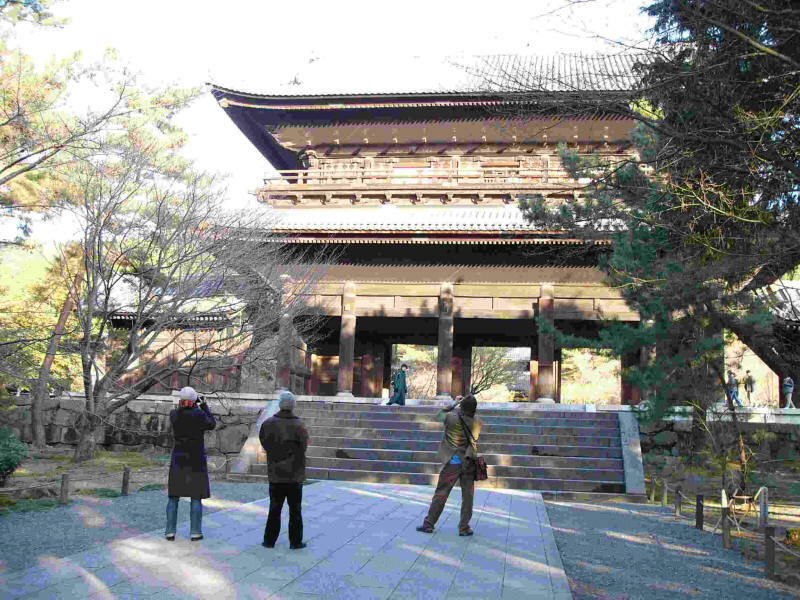 After a morning tour of the historic temples of Nara Park, a Symposium was conducted to share the results of the conference through public presentations and panel discussion. This was attended by about 220 general citizens and commenced with Messrs Suga and Thompson re-presenting their conference papers. Following a break, the President of the Freight Railway Museum Sasada Masahiro delivered the same paper which Iwasa Katsuji had previously presented to the conference. The final presentation was by Ragesh Agrawal who gave his highly subjective summary of the overall common themes about rail heritage that he considered had emerged over the preceding days. The panel then responded to some of the many written questions that had been submitted by the audience during interval. A huge proportion were addressed to Mathew Thompson as the Japanese sought to get a better understanding of how voluntary involvement in rail heritage functions. Before returning home the following Monday, I visited the Modern Transportation Museum adjacent to Bentencho stations (JR & subway) in inner-suburban Osaka. This static museum, operated by JR-West has 5 steam locos, 3 diesel locos, one electric loco as well as 3 passenger cars and four Shinkansen (Bullet train) electric railcars, together with a rich display of models, Audio visual displays and small exhibits ranging from tickets through CTC panels to Powers punch-card accounting machines. There was also a bus, a small plane and several motor cars. Attendance was huge and seemed to comprise mostly parents or grand parents bringing their pre-school aged or early primary school aged children. In that respect the Japanese visitor profile seems closer to what we see at a Puffing Billy Thomas event than the slightly older children in families on our excursion trains. Whilst the whole experience was most enjoyable and interesting there were few specific "lessons" that I could identify as being highly relevant to PBR, or Australian rail preservation generally. Given that the conference objective was to help the Japanese (and perhaps Chinese & Koreans) learn about rail heritage experiences elsewhere this was not unexpected. The closest we have to the major Japanese rail museums (Tokyo, Osaka, Umekoji) is "The Workshops" Museum at Ipswich but these were established by the then government owned JR (to mark the 90th & 100th anniversaries in 1962 & 1972). Although since the 1987 rail reforms both JR-West and JR-East seem committed to their continuation, one wonders what might happen if those companies encounter severe financial pressures some time in the future. For now, any railfan visiting Japan can be assured of a rich and varied array of over two dozen heritage display or operating sites and operations as well as one of the most modern passenger networks in the world.